I was really excited about making this mac n cheese dish. While browsing Food Buzz and tweeting, I came across huggingthecoast.com. I thought to myself, oh man this is the ultimate seafood site. Being a Philly born now Floridian, you can understand my enthusiasm. Red just loves mac n cheese so, even though the hubby is on a low carb diet, I just couldn't resist. I did make a few changes in the ingredients, used what I had on hand. Our local grocer did not have smoked paprika or liquid smoke so I made an alteration there too. I cut the recipe in half, except for the wine, as it serves 8. Macaroni and Cheese Paella with shrimp and scallops, my way! 3 Tbsp - chopped sun-dried tomatoes Rotel diced tomatoes with green chilies and cilantro, drained well. Cook orzo according to package directions to the al dente stage. When done, drain, rinse (to stop the cooking process) and set aside. Meanwhile bring 3 tbsp olive oil and the bay leaves to medium heat in a large heavy skillet. Add half the garlic and saute a bit, do not let garlic brown. Add the shrimp, scallops, and 1/2 tsp salt; toss to coat. Add the capers, paprika, St Louis mesquite seasoning and stir until shrimp and scallops are well coated. When seafood is just cooked through, remove shrimp and scallops from pan with a slotted spoon, leaving the bay leaves and as much sauce as possible. Set shrimp and scallops aside. Add the wine to the pan and stir, letting the alcohol cook off for a minute or two. Add the remaining garlic, the onions, and cook until the onions are just softened. Discard bay leaves. Melt the butter in the pan with the onions. Add the flour, stirring for 2-3 minutes to cook the flour, then add the milk and chicken broth gradually, continuing to stir as the mixture thickens. When the sauce has fully developed, add the peas and bring sauce to a simmer. Reduce heat to medium-low and gradually add the shredded sharp cheddar cheese, stirring until melted. Adjust salt. In a large non-stick paella pan or baking dish, combine the cheese sauce with the orzo and stir thoroughly to coat. Gently fold in half of the shrimp/scallop mix, the pepper jack cubes, and half of the parsley. Bake in 350 degree oven for 10 minutes. 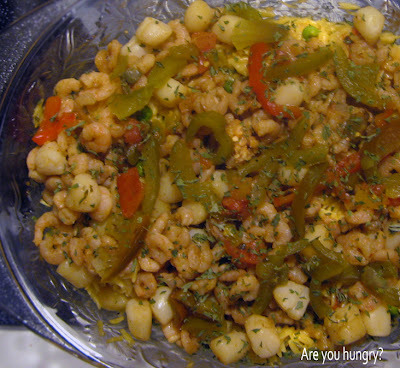 Top with remaining shrimp/scallop mixture, olives (if desired), Rotel and red pepper strips and return to oven for 5-7 minutes. Remove from oven and sprinkle with remaining parsley. Cook’s Note: Smoked paprika, with its unique and delightful flavor, is the secret ingredient of classic Spanish cuisine and is well worth seeking out. It can be found at many gourmet shops, specialty food stores, or online. Though there is no direct substitute, an equivalent amount of good quality regular paprika with 2-3 drops of mesquite smoke flavoring added can be used with good results. The original post at hugging the coast. I was right to be excited about this seafood pasta paella, it was really delicious. Red ate at least three servings, and the hubby enjoyed a nice size serving along with his chicken. As you can see there was plenty of seafood on top, allowing him to avoid most of the carbs; he was quite impressed with the flavor. This turned out so well I'm going to make this my first entry to Presto Pasta Nights, which is being hosted this week by the lovely founder, Ruth Daniels, at Once Upon a Feast. This looks soo good! Im a Philly girl too, where did you live in Philly! ? Awesome cheese with the shrimp and scallops sounds fabulous! This sounds delicious Kathy! So yummy! Ooh that looks so good! I'd have never thought to dress up mac and cheese that way. I think I'd rather use the larger shrimp but only because I have some in the freezer, possibly freezer burnt but I bet that wouldn't matter with all the flavor. Very unique. I couldn't get over here fast enough when I saw the title posted on twitter. :) I think I would have added saffron or a packet of Sazón to push it even more to the paella flavors. What do you think? 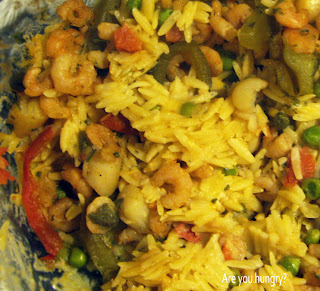 I love all the flavors of paella, and it sounds great as a pasta dish! Oh yeah Joan, I think you're right a packet of Sazón would have been great, I love that stuff. Maybe the one con Cilantro, too bad I didn't think of that! Thanks so much for sharing our recipe! I'm so glad you enjoyed it. Love how you crossed out the ingredients you didn't have in the original recipe, then shared your substitutions...very clever! OMG! I love it! I will be doing this one soon for sure. I have been to that site before too, but had forgotten about out. Thanks for the reminder, its a great site. I have been craving seafood, especially wanting to get one of those giant burlap bags of oysters. Wow, what a fantastic first entry for Presto Pasta Nights. I love the notion of combining mac 'n cheese and paella. This looks incredible! I've never seen a dish like this. It's a combo of two delicious classics. How unique and delicious! What a great idea to use all of these paella seasonings with orzo. Sounds great! Huggingthecoast is an excellent food blog of Doug! Mac and cheese more paella is a wonderful combination – yum! Oh my word, that looks amazing!!!! :) Real comfort food. :) I think I actually like your alterations better than the original recipe. Thanks so much for stopping by the party. I'd love it if you have a chance to link up...I'm leaving the link open until late tonight. :) Have a great day! Wow! That looks really good and filling..yum!! That looks really interesting. I think that the recipe has a lot of options for switching it up! A great way to serve up some seafood delights. I would never have thought to mix mac and cheese with paella but it sounds and looks delicious! This is definitely a husband pleasing meal. Mine will love it! This looks so yummy, I am going to have to make this one. I would be will to bet that it is just delightful. Thanks for sharing this. I may try this for one of our girls nights. No one in my house would eat it except me but the girls will LOVE it.